The AgMark L.L.C. rail terminal in Concordia, KS, is one of the most automated grain handling facilities in the United States, thanks to an electronic Grain Management System developed by Woodbury, CT-based CompuWeigh Corp. (203-262-9400/ www.compuweigh.com). It minimizes the number of people required to operate the facility. 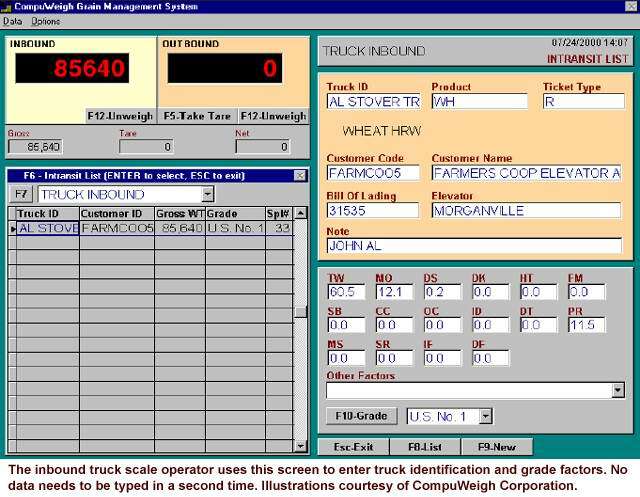 It does this by removing unnecessary functions such as “walking the track” to identify railcars, elimination of repetitive data entry through tight integration with the facility’s AGRIS grain accounting system, and allowing the computer system to manage the operation of all the equipment. It improves facility worker safety by constantly monitoring key components to make sure they are operating within specifications. It automatically takes action to shut down equipment or perform other necessary functions if the operators fail to act in time. The rail load out system. Truck receiving is designed so that the driver remains in his or her truck at all times, except to open the truck gates at the receiving pit. After weighing, GMS prints the driver’s scale ticket remotely at the outbound scale, so there is no need to return to the control room. The Gamet Apollo probe station is unmanned. To accomplish that, initial truck identification is handled from the office by intercom. The operator takes a sample from the truck, guided by a CCTV video camera, which is then sent to the control room via pneumatic tube for grading. Inside the office, Kansas Grain Inspection Service (KGIS) inspectors test the grain and determine its factors. Once these factors are entered into GMS, the automated system calculates the U.S. Department of Agriculture grade. This information is available to the receiving pit operator at his or her station. Because the GMS system is fully integrated with the AGRIS grain accounting system, data entry is reduced to a minimum. The GMS operator can find the correct contract information in the AGRIS system with two or three keystrokes. The system is capable of handling split accounts ‘on the fly.’ Completed transactions are sent back to the accounting system automatically, and the AGRIS system updates the contracts. There is no retyping of data at any point. Review each truckload’s grade factors. Select the destination bin from a browse list of bins containing only that commodity, thereby preventing mixed grain. The operator selects the destination bin while the truck is being dumped. The GMS determines whether this is the same bin as the previous truckload. If so, the pit gate will open immediately. If this truckload is going to a different destination bin, however, the pit gate will not open until purge timers run to ensure that the legs and conveyors are clear of product. At this point, the GMS will redirect the electronic Schlagel distributors automatically, set the diverters and gates to their new position, and only then open the pit gate. This feature is an essential element in handling identity-preserved grains that require segregation. Using the screen shown on the left side of page 46, the operator can monitor the status of all key equipment. At AgMark, this includes 17 bins, five legs, two belt conveyors, 11 drag conveyors, two screw augers, three distributors, 24 gates, two diverters, a Rotex Megatex cleaner, a dust collection system and a stationary tripper.If any of this equipment begins functioning outside of its normal parameters or fails to function at all, GMS immediately sends the operator an alarm. If the operator fails to act in time, GMS automatically turns off the equipment in a logical sequence.In addition to the PLC, GMS also continually monitors other key equipment, including Rolfes bearing, belt alignment, motion and grain temperature monitoring sensors, plus a Kistler-Morse ultrasonic bin level monitoring system. As a result, the operator can see the level, grain quality and grain temperature inside each bin in ‘real time’. An automated load out system like AgMark’s differs dramatically from a manually-operated one. It almost completely eliminates clerical work. The AgMark facility uses a CompuWeigh SmartRead RF tag reader, which automatically identifies each railcar by its radio frequency tag. This information is read into GMS, which instantly consults its internal database of 270,000 rail cars, the constitutes the entire fleet of railcars in grain service in North America. From this data, GMS instantly calculates the maximum amount of grain that can be loaded into each rail car, while still meeting the weight limits set by the Rail Carrier. It also ensures that the grain will fit physically into each rail car. The use of the SmartRead system also completely eliminates the need to walk the track, enter this information into the scale workstation, or re-enter the information into the AGRIS accounting system at the end of the transaction. Since the Burlington Northern Santa Fe typically offers a $10,000 bonus if a 110-car unit train is loaded in 15 hours or less, elevator operators are under tremendous pressure to achieve both speed and reliability. Any downtime is of major concern. AgMark’s rail load out workstation is equipped with CompuWeigh’s SmartTech software, which automatically diagnoses any problem with the InterSystems bulk weigh scale. GMS shows the operator on the workstation screen what the problem is, where it is and how to fix it. In most cases, the operator will be able to fix the problem right then and there. But even with more complicated problems, the operator will be able to tell the scale dealer the exact nature of the problem, so the dealer can bring the correct replacement parts. All of the physical equipment needed to load railcars is under the direct control of the GMS system. Once the correct blend has been determined, the equipment will start up automatically in the correct order. To ensure that the blend is correct, the system can be started in ‘slow flow’ mode, in which each gate contributing to the blend is opened to a smaller extent but still in proportion to the overall blend. At that point, a sample is taken and sent to the KGIS lab and adjustments are made until the blend is correct. At this point, the operator moves a avolume’ slider on the screen to ‘full flow’ mode, and all the gates contributing to the blend will open to the correct percentage while maintaining their proportion of the blend. The supervisor has complete visual monitoring of the entire elevator from his office. The supervisor’s screen shows the whole operation in real time, including what is happening at the receiving pit and at rail load out. The GMS system automatically logs all key information, so that events that happened in the supervisor’s absence can be viewed later, both in report and in graph format. This information shows exactly how the equipment was being used, when the computer logged a problem, how quickly the operator acknowledged that there was a problem, and then how quickly the problem was fixed. 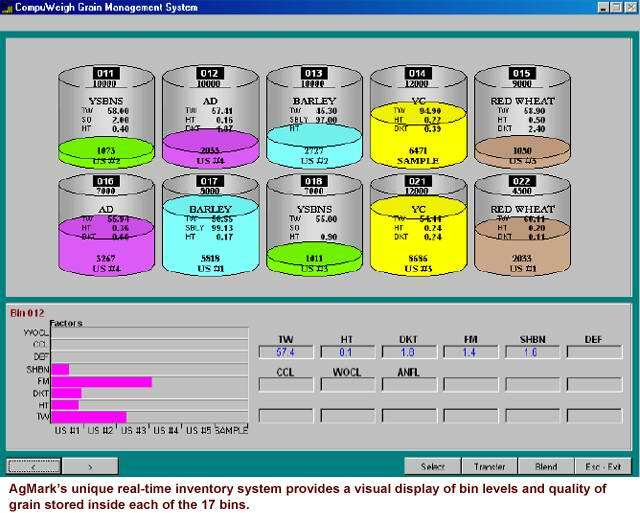 A completely unique software module at AgMark is the real-time inventory system (shown above), which displays the bins graphically in 3-D, showing by color the commodity in each bin, the level in each bin and the quality of each bin by grade factor. To calculate quality, the GMS takes the level data provided by the Kistler-Morse ultrasonic sensors, taking into account the most recent transactions that brought the bin to that level and then calculating the weighted average quality for each factor. This completely eliminates the need for a manual bin board and provides more accurate blending information than could possibly be expected from a manual system. The inventory system requires no manual work – it’s completely automatic. Real-time information is always at the supervisor’s fingertips. Six standard reports can be run at the press of a button. In addition, the GMS Wizard Reporting System allows the supervisor, even without any computer skills, to design his own report, which can be printed, illustrated with graphs, e-mailed or dropped into a spreadsheet for further analysis. “Using the GMS, so far, we’ve loaded out 1,500 railcars and completed twelve 110-car unit trains in times ranging from nine to 13 hours per train,” Mark Paul commented late in July.